The internal components of this single ground blocks are much different from a standard frequency VHF/UHF ground block. The center coax conductor indexes into a close-tolerance tube that is resilient (spring) brass and is gold plated. The close center-tube tolerance assures a tight connection, the gold plating assures a good electrical connection and the overall performance is greatly improved over standard designs. DIRECTV approved. SCTE Outdoor Compliant bonding block. Rated for 0 MHz to 3 GHz. One inch spacing between centers of ports. UV resistant rubber weather seals provided. 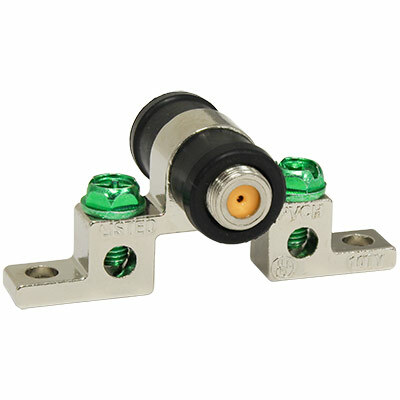 Internal components designed for high frequency and low loss. Gold plated center conductor assures good connections. Resilient internal metals for dependable repeated insertion connections. Minimal insertion and return loss numbers. Two mounting screws are provided with each block.